1. Preheat the oven to 180ºC, gas mark 4. Prepare a 12-hole muffin tray and line with 8 Waitrose Cooks’ Homebaking Tulip Wrap muffin cases. 2. Cream together the butter and sugar until light and fluffy. Add the treacle, followed by the egg and egg yolk, and beat the mixture until well combined. 3. Sift the flour with the spices, add to the mixture and continue to beat until smooth. Mix the hot milk with the baking powder, add to the mixture and beat until combined. 4. Spoon the mixture into the prepared cases and place in the preheated oven for 25 minutes, until the cupcakes are springy to touch. Remove from the oven and leave to cool completely before icing. 5. For the icing: beat together the butter, soft cheese, cinnamon and icing sugar. Add the milk and beat until light and fluffy. Spoon this icing into a Waitrose Cooks’ Homebaking Piping Bag, cut off the end so you have a wide nozzle and use to pipe the cooled cakes. 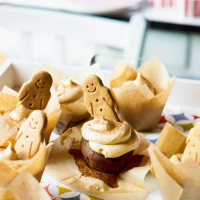 Top with a gingerbread man and serve with a dusting of cinnamon.